Inflation has thrown a wet blanket on Eid-al Adha this year. Goats now cost 40%-100% more, forcing Muslim families to go in for alternatives like bulls, which offers a more sacrificial meat at the same cost. Around the same time last year, Munir Khan, 40, a resident of Mazgaon, had been able to buy three goats for Rs27,000. “This time, they are asking for 40,000 for the same. Even the weak ones cost around Rs10,000-Rs15,000. It looks like we will have to buy less,” said Khan. Goats differing in size and breed cost anywhere between Rs10,000 and Rs5 lakh — the highest a shop has demanded at the Deonar abattoir. These are mostly from Rajasthan, Madhya Pradesh and Uttar Pradesh. Those on a watertight budget have settled for bulls. “It is said that if a bigger animal like bull is sacrificed, it’s seven times the sacrifice of one goat,” said advocate Zubair Azmi, a 50-year-old resident of Madanpura. As per tradition, meat that is sacrificed is divided into three parts — the family retains onewhile the others are divided equally among relatives and the poor. 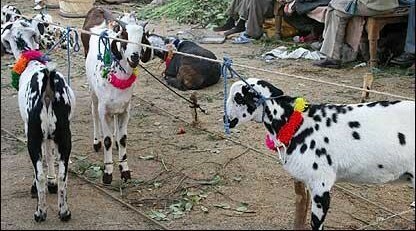 Some like Rizwan Coatwala, who have made it a point to sacrifice one goat, will be doing it outside Mumbai. “I usually keep Rs10,000 aside for it, but since the market is steep, I bought a goat for Rs7,500, inclusive of all costs, in Parbhani. We will be doing the qurbani there,” said the 31-year-old resident of Dongri, who works as a client service manager.